Encouraging your kids to learn an instrument is always a great idea, and drums are relatively easy to pick up for children – they’re also a lot of fun, and have a ‘coolness’ factor to them. But here’s the thing: it’s much easier for them to stick with an instrument if they feel comfortable playing it. The best drum sets for kids are designed with their smaller statures in mind and are much cheaper than full sized sets – which makes it easier for you as a parent to invest the money without worrying about your kids sticking with it. A good drum set is one that can be adjusted for height and angles, allowing it to “grow” with your child as they get older and taller. Drum sets aimed at kids will rarely have more than 5 pieces. 3 and 4 piece kits are also common. Also, remember that travel drum kits also double up well as kids sets. 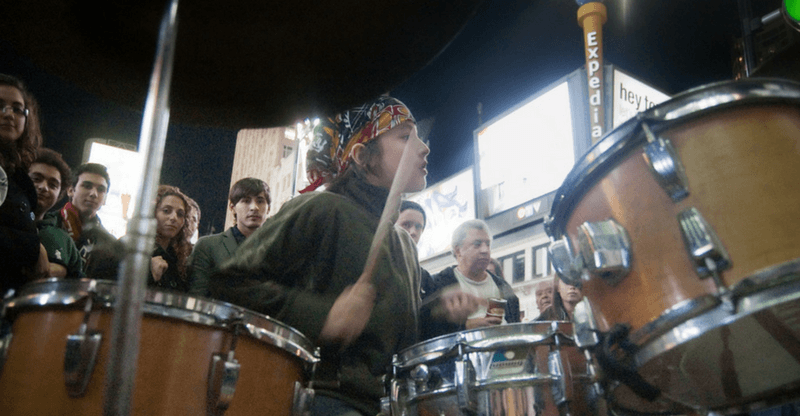 Many drum sets for kids are actually just toys, and are in no way comparable to instruments, and will likely fall apart and be made of cheap materials that cannot be tuned or even produce a pleasing tone. 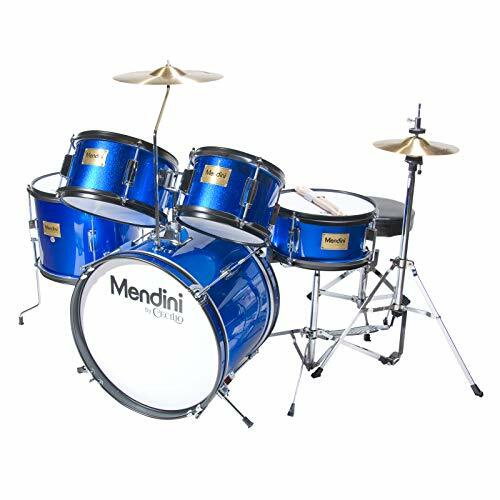 The best junior drum sets are full-size kits, scaled down to be a better fit. Cymbals included with most kids sets will be of poor quality – investing in cymbals separately will benefit your child’s drumming progression immensely. Replacing the stock drum heads with aftermarket versions is cheap and another way to easily boost the sound quality of any junior drum set. Many drum sets aimed at children are unsuitable for those taller than 5ft. Past this point, it is reasonable to progress to a full-sized drum set using the drum shells with a smaller radius if necessary. A shrunken down version of a full-size kit – it’s not a toy. Very sturdy hardware, easy to adjust and holds strong. Doesn’t come better for a junior kit. Gammon is a family run business that makes solid entry levels kits for adults and children alike. This junior set is the cheapest on our list, and for the money, you get heaps of value. It’s a five piece kit made with real wood shells, 16″ bass drum, two tom drums, snare drum and all the other bits of hardware you’d expect in a complete set. If you want to introduce your kids to drumming, and spend as little as possible while still giving them a perfectly good kit, this is for you. The quality doesn’t match up to the Ludwig Junior above, but then it is much cheaper. The only downside is the crash cymbal. It’s fixed to the center of the drum set, rather than on a stand which would normally be placed behind the set (which you’d assume is a cost saving thing). This can lead to young drummers needing to ‘unlearn’ certain habits and motions as they progress to a set that has a standard set up. Decent enough quality, from a great brand. This set is only suitable for children up to 5ft tall. Hardware is of lower quality compared to the Ludwig. Crash cymbal in an unusual position. Very similar to the Gammon in terms of quality and price, this option from Mendini is a five-piece budget option. 16″ x 11″ bass drum with bass drum pedal, 8” x 6” and 10″ x 5″ toms, 12” x 10″ floor tom and 10” x 6″ matching snare with stand. Like the Gammon, the crash cymbal is fixed to the center of the kit, which isn’t ideal. It’s available in 6 colors, allowing your child to choose a set in their favorite color, which can go a long way to encouraging them to practice more. 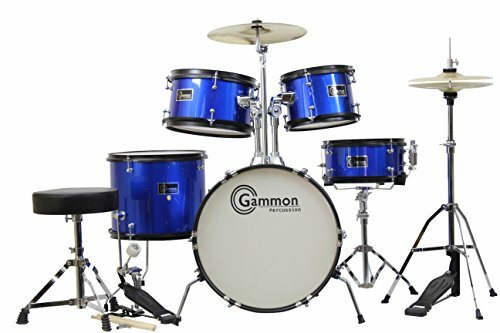 This set has everything you need to get your kids set up and playing, and it’s a perfect gift for the young drummer. Easier to tune to get a good tone than other junior drum sets. The bass drum is the worst sounding part of the set, aside from the usual cymbal problems. Only suitable for children up to 5ft. The crash cymbal is mounted on the bass like the Gammon percussion junior set. All the kits we’ve reviewed so far are acoustic sets. To mix things up a bit, here’s a low-budget electronic kit. In many ways, an electronic kit is preferable as they allow for silent practice and have a much wider array of sounds available for your child to experiment and play with. You don’t have the issue of tuning that you do with acoustic sets either, plus it folds down into a compact package that can be stowed away when your kids inevitably grow tired of it. It’s also got better longevity, as it can be adjusted as they grow. The frame is adjustable, allowing your child to use it as they grow older and is also suitable for adults. Ability to record and playback sessions to target key areas for improvement. 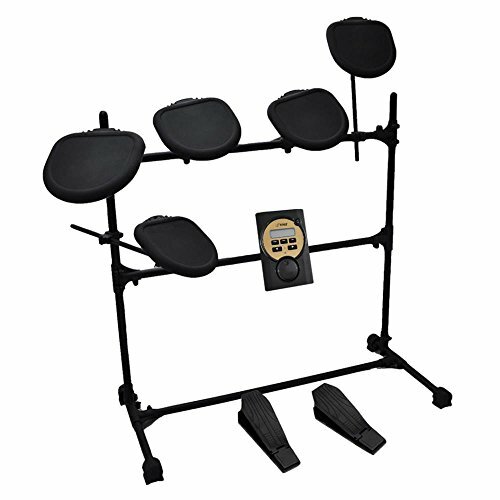 One of the cheapest electronic drum kits. Small sound bank compared to more expensive electronic drums. Doesn’t have lights to teach drumming patterns as some other electronic kits do. Pad layout has a very linear configuration compared to traditional drum layouts. The last one on our list is for the slightly older kids – more suitable for pre-teens and older – as it is a full sized kit. However, it’s reasonably high quality for an entry-level drum set, and can be upgraded further without costing too much more. There is also a range of videos available on Pearl’s website demonstrating how to configure and tune it for the first time. Good quality materials is a step up from the other acoustic junior sets. Cymbals stands are of high quality. As a full-sized set, this isn’t suitable for children under 5ft. 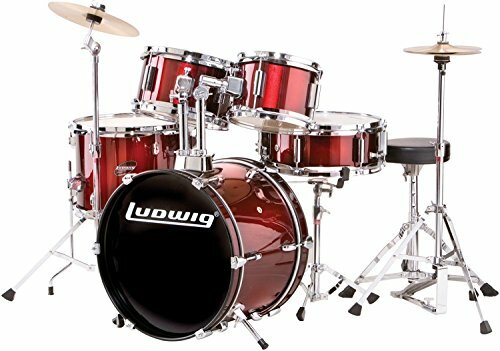 ​For children under 5ft, the Ludwig Junior set presents the highest quality sound, but in terms of value for money, the Gammon Set is the better choice. With correct tuning, both are good instruments, but the layout of the Ludwig is better for fostering correct technique early. 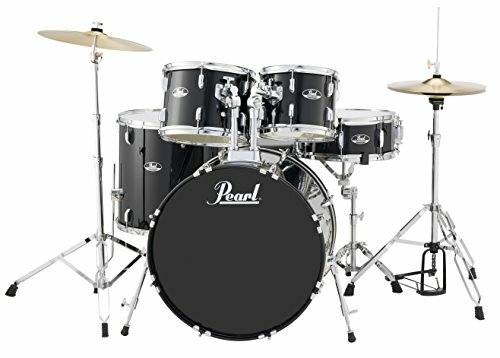 For older children, the Pearl Roadshow is a great entry level kit that’s budget-friendly and easily upgraded – although chances are that if your child is a serious drummer they will soon want a much higher quality drum set. As the only electronic kit we’ve included on the list, the Pyle PED041 is an interesting choice that will allow your child the freedom to practice at home while causing minimal disturbance. However, the layout and playing technique are very different from an acoustic set, so this should be kept in mind if it’s going to be the only drum set for your child to learn on at first, as it could cause difficulty if they transition to an acoustic set.